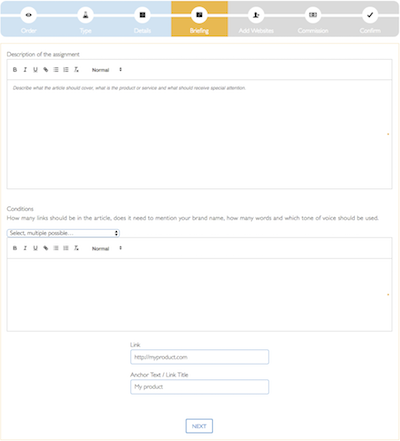 Creating a campaign with LinkPizza is easy. You start your campaign on our campaign page. 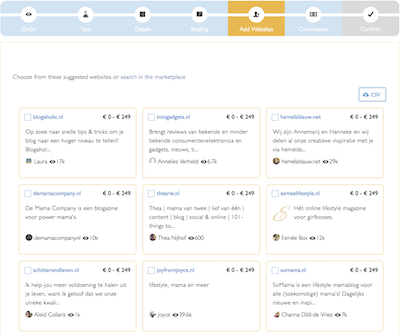 On this page you're guides by a timeline which shows which step you're in and what to expect.. This is where you choose to start a public or a private campaign. By starting a public campaign, your campaign will show on our campaign page which will provide publishers the opportunity to pitch. 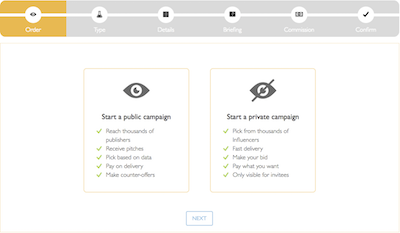 If you prefer to select publishers yourself, you can start a private campaign. 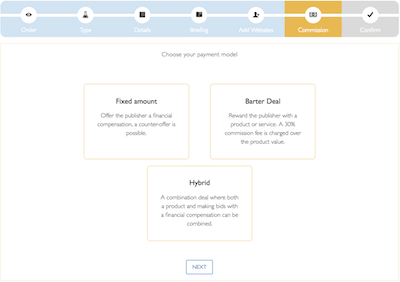 Remember: In case you choose to start a private campaign, the offer you make a publisher, will be the amount of money you would have to pay once the publisher accepts your offer. This is where you choose if you would like to place an advertorial, editorial or a review. The type of content you choose, depends on your content goals. 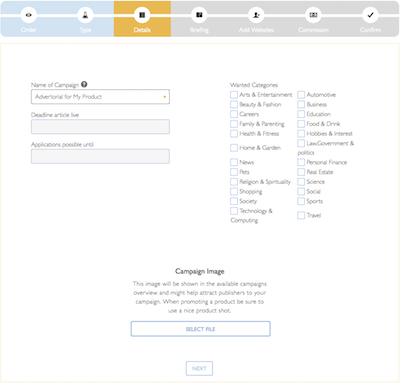 Here you determine your campaign's name, deadline, categories and image. Remember: the image's design is 340px by 136px. Here you provide a description of the content and its conditions. You provide publishers with general information about the brand or a specific activity and what conditions the article must meet. We have pre-filled some commonly used conditions. You may pick multiple conditions when and add some of your own. This is also the place where you fill in the URL you want publishers to use and the URL's anchor text. Make sure you don't add dead links. If your URL changes, please let us know and we will adjust it for you after your campaign is live. Remember: this step only appears if you're setting up a private campaign. In this step we will show you our suggested publishers and you will be able to find and select publishers in the marketplace. By using the filters in the marketplace, your will find the perfect publisher for your content goals. 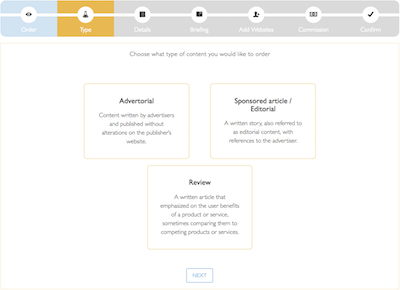 Just select the box next to the website and the publisher automatically appears in your campaign overview. This is where you will choose if you want to pay a fixed fee, a barter deal or a combination of both in the form of a hybrid model. Here you may also add an additional variable fee. This fee can only be applied if your brand is connected to an affiliate network. This is where you check the campaign and confirm your order. After you have ordered the campaign, we will check to make sure the briefing is clear and the links are correct. You will receive a message once your campaign is approved. If you would like to adjust your campaign at a later stage, you can do so by clicking "edit" on the right side of your campaign overview. This could be necessary if you have launched an ongoing campaign that needs some briefing adjustments over time. Remember: after you have ordered the campaign, you won't be able to adjust it. If you do want the campaign changed in any way, please let us know. We are happy to help and make any adjustments needed! If you have any questions, please contact us. We can be reached through the chat on our website, via a reply to this mail, or by phone: +31 (085) 888-3186.